We popped over to a friends in the village today as they said the wild garlic was ready to harvest. For the last few years we've said we were going to harvest some to eat and never got round to it, so it was nice to finally get some! This time of year it just blankets the ground, it's early so there are no flowers yet, but the smell is strong in the air. It didn't take long to get half a bag full, plenty for what I had in mind. 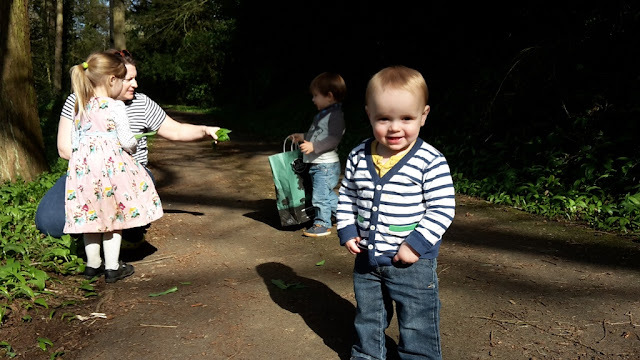 An troop of little helpers! It was the perfect afternoon for this type of activity and my friends land is just magical anyway, a lovely old estate where you discover something new every time. It was a perfect spring day (although it's not quite spring yet!). 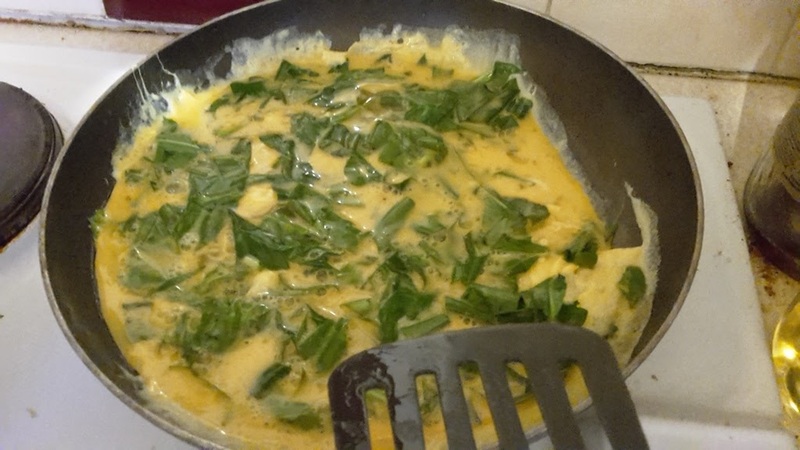 Tonight I just chopped up a large handful and added it to a simple omelette for tea (with mushrooms and cheese of course), my middle daughter wasn't convinced with the green bits until I reminded her that she helped pick them, then she was picking out the the leaves to eat! She was very proud of her contribution! It tastes lovely and is quite a subtle flavour, not at all as strong as you'd think it was going to be. I'm thinking now I need to make a pesto with the rest of our harvest, unless anyone else has a great recipe? 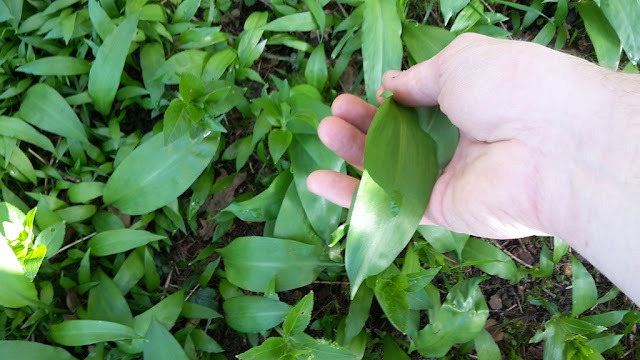 Do you harvest wild garlic leaves (ransoms)? I have never seen wild garlic here. Why don't you plant some in your garden? There's no need to really, so much growing wild that I could never use it all! I might put some in the coppice area one day when the grass has died down. Over here they call those Ramps. I've heard American blogs talking about them. Do you ever use them? Unfortunately I have not. I found some growing wild a couple years ago and transplanted them to my garden, but they did not survive. Okay, that answers my question why your wild garlic is different than ours. 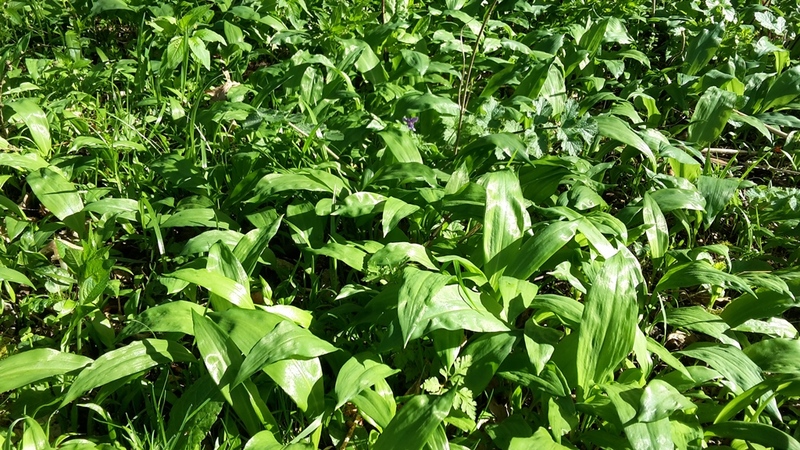 Ramps are something I've tried to grow several times but so far have had no success, even though I live in ramp growing country! They like shade and would be a good addition to my shady areas. And they are perennial. I'll have to give them another try after seeing your posts. As I was driving home on Monday, I think I saw a patch. I must stop and have a closer look. Makes a tasty addition to a meal. Apparently they're good just wilted down and used like a garlicky spinach. I have some wild garlic in the garden, kindly given to me by Dawn. Need to take a look at it as Jon mentioned having seen it the other day! 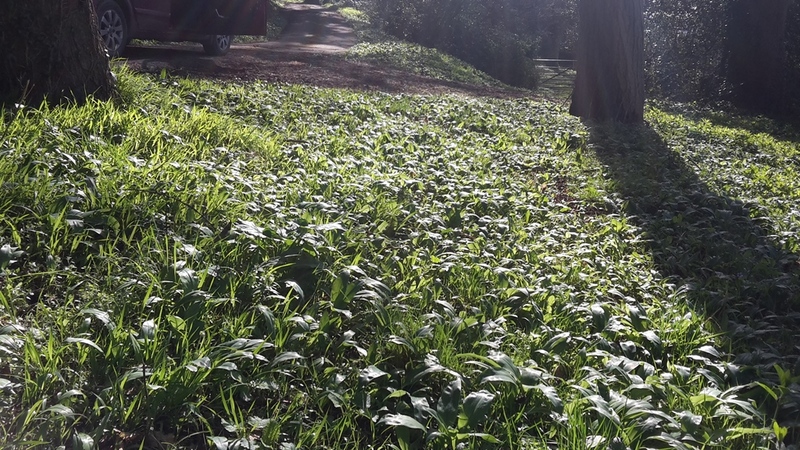 we live for ramps here! i won't be picking mine until the end of april. ours never come in this early. i make SO much with ramps. they are good with pasta, i make pesto, i make them into kimchi. we eat them with eggs and just sauteed on their own. i couldn't see if you pulled them out to get the bulb? that is the best part. use them like green onions. they are so good sauteed and served on top of hot dogs. chop them and mix them with minced beef for hamburgers. people make ramp vinegar and ramp jelly. you can make a wonderful ramp bread too. we will be going to a ramp festival in april and i will post it. you can type ramp festival in my search bar and see all kinds of dishes made with ramps! my son drinks ramp milkshakes...they actually aren't so bad. 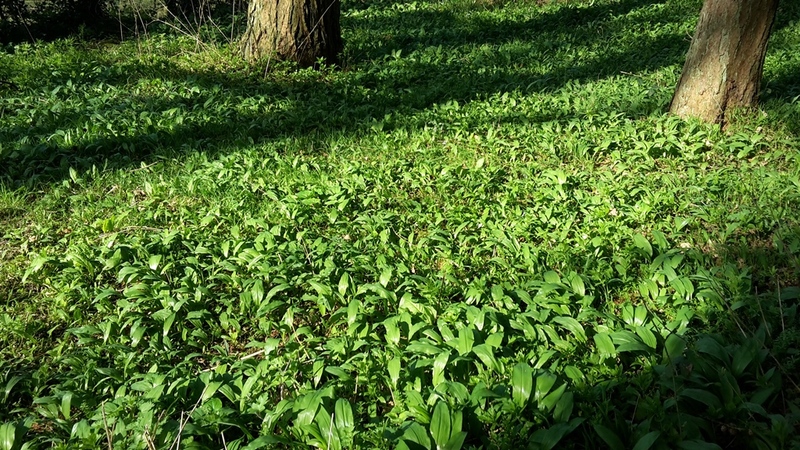 I do remember seeing some wild garlic a few years back in the woods. I stumbled upon it and picked some, but didn't have the courage to eat it because I just was unaware if it was okay or not. But yours looks really delicious in that omelet. It's nice to hear that it's not as strong a flavour as you thought. I LOVE garlic but sometimes my stomach rebels if I eat too much! We are lucky to have an abundance in our area. We eat it like spinach, added to frittata, omelette, pizza, mac and cheese, salads anything really. I also make pesto by whazzing it down with walnuts, parmesan and rapeseed oil and freeze in small portions for use when it's not in season. This is lovely mixed into pasta, spread on pizza or bruschetta. The flowers are deliciously intense in flavour and great in salads. Can't wait to harvest this years! I usually make a large stash of pesto and freeze it in ice cube trays (tipped into bags once frozen) to last until the next picking season.